We followed Route 132, relishing the food, communities and backdrop of where the land meets the sea. Our final stretch was the part of Gaspé known as Chaleur Bay, a nod to the largest bay in the Gulf of St, Lawrence, known for its microclimate and warm waters. 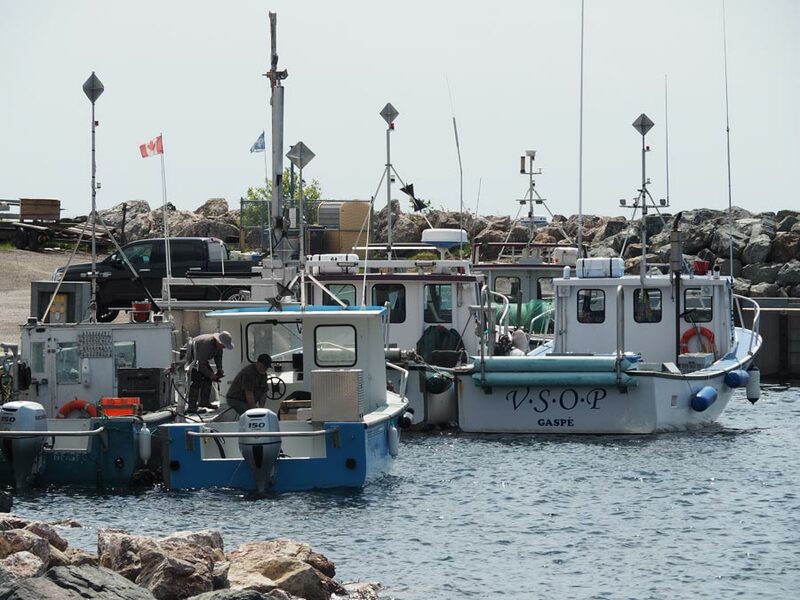 It was in this part of Gaspé, in the small community of Paspébiac, that the region’s trade of cod fishing was founded. 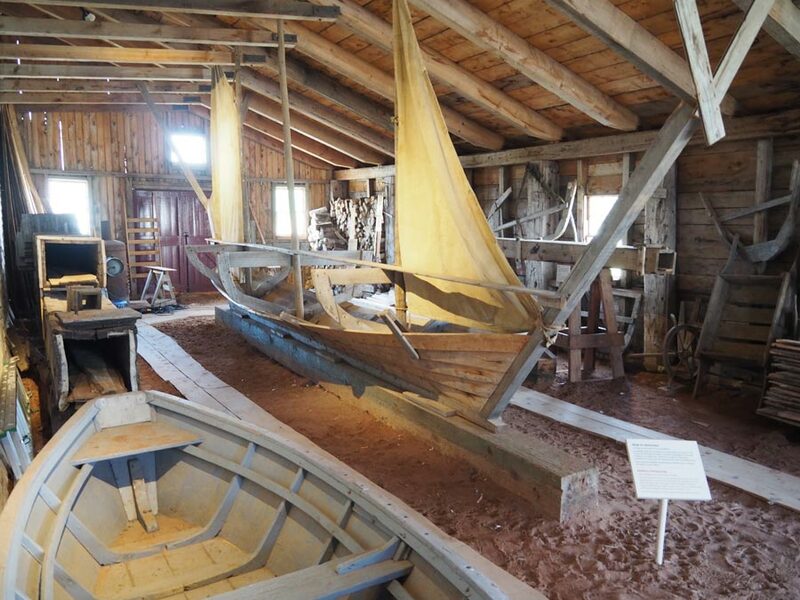 At the waterfront Banc-de-Pêche de Paspébiac National Historic Site, almost a dozen restored historic buildings tell the story of the cod fishing, salting and packing industry that once made this coastline the largest cod trading business in the world. 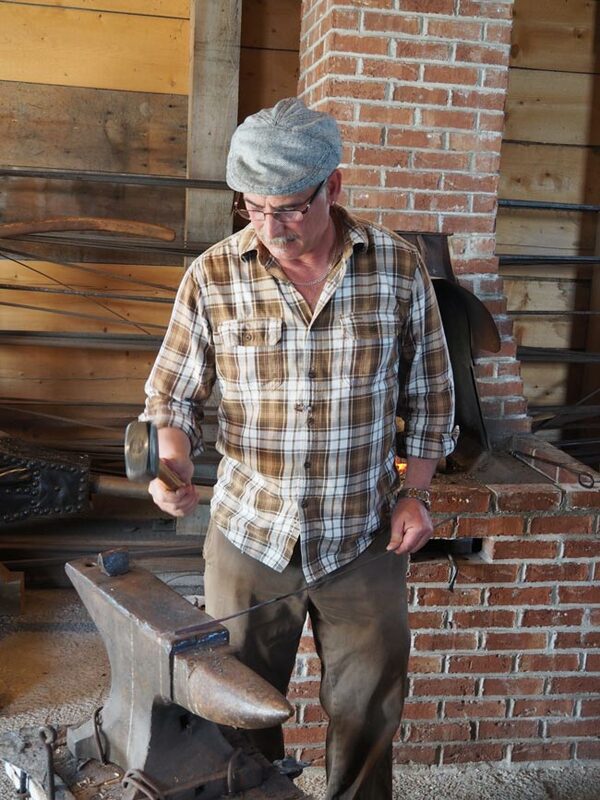 Blacksmith working at Banc de Peche. “It all began here in 1776,” explained our guide, “when the Robin family came from the Jersey Islands and established a cod processing empire. In 1838 the three Le Boutillier brothers set up another business to dry and process cod and soon both companies were shipping across North America, Europe and the Caribbean. At its peak in the mid 19th century, the Robin and Le Boutillier companies had established vast commercial holdings, with activity that opened up fishing villages all along the Gaspé. There were about 1,400 barges fishing at the time, each hauling a daily catch of about 600 cod, all placed outdoors on racks and dried by the sun. The industry employed 2,000 people, including entire families from children to grandparents. The restored buildings were part of the Le Boutillier holdings (the Robin buildings were destroyed by fire) and include a storage barn, the general store, the shipbuilding shop, the blacksmith shop and the cooperage. Many of the carpenters were recruited right out of school on the Channel Islands, bringing with them their rich Jersey traditions of shipbuilding. There are many spots along Route 132 to buy fresh fish but right behind the museum we discovered the dockside poissonniere, the fish shop, with fresh scallops, shrimp and lobster at bargain prices. The Chaleur Bay region continues the Gaspé traditions of good meals created from ingredients grown and crafted locally. It would have been easy to zip along the roadway and miss Ferme Bourdages – a strawberry farm and micro-winery – and what a mistake that would have been. 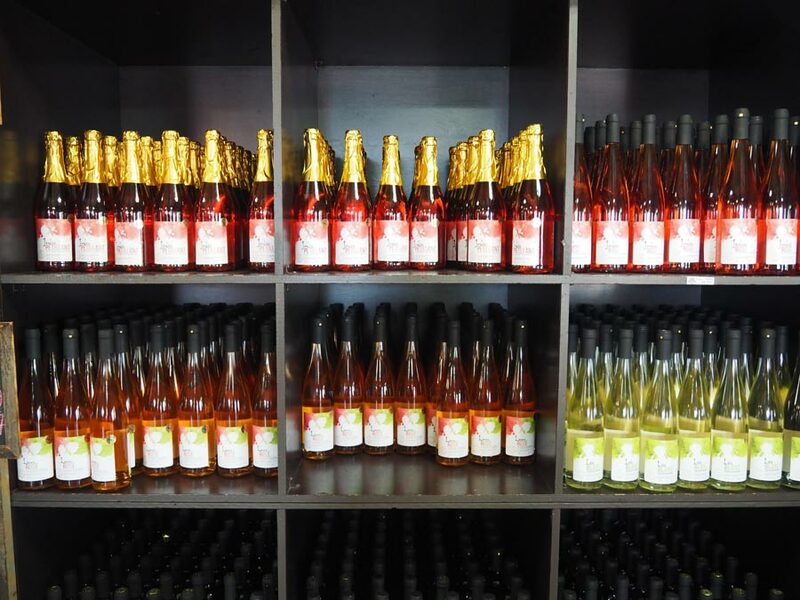 The 7th-generation Acadian family has been farming this land for two centuries and have taken their crops and wine know-how to create rhubarb wine, strawberry wine and their aged Francois Digestif, made of strawberries fortified with apple brandy. The shop shelves are filled with the full range of wines, fresh baked goods, local preserves and maple syrup. Our final stop in Gaspé spoke to our geeky side. There are few places in Canada that capture the imagination like Parc national de Miguasha, a Quebec park and UNESCO World Heritage site, celebrated in the field of palaeontology. 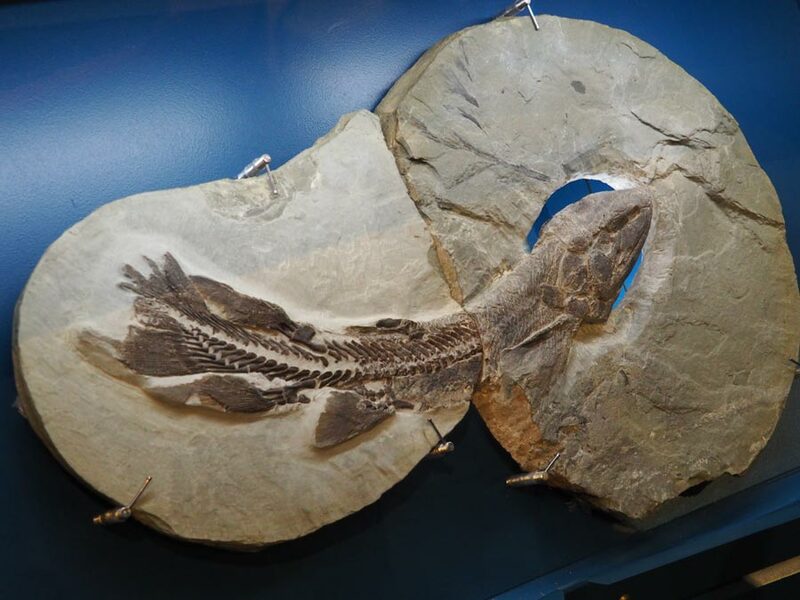 Miguasha represents a window to understanding life during the Devonian Period (419-359 million years ago), a period known as the Age of Fishes, a crucial evolutionary time when an animal with a vertebral column was preparing to crawl out of the water and onto dry land. It was before dinosaurs, before reptiles, even before mosquitoes. The fossils discovered along the shoreline show lobe-finned fishes with fin structures similar to early limbs, establishing the link between humans and fishes. In 2010 a world famous discovery unearthed a complete fossil – the only one known – of Elpistostege watsoni, a 380-million-year-old fish and the largest fossil fish discovered at Miguasha in 130 years of research. During the Devonian period, the continental plates that made up Europe and America collided together to form a single continent, giving birth to the Appalachians. Much later, the two continents would separate again, creating the wide Atlantic Ocean. It was a warm, soupy equatorial estuary, the perfect conditions for what has become one of the world’s most famous fossil beds. Although ever-changing, the Gaspé’s traditions and heritage survive. We started our road trip adventure looking for a Canadian destination with stunning vistas, great camping, tasty local dishes and friendly people. Gaspé delivered, and we will be back again.